THIS IS 6 or so weeks late!!!!! Whilst in Brazil, we were thinking of our next plans. We knew we wanted to cycle around South America but we were struggling to find quality gear at reasonable prices. The problem being everything is imported and thus taxed a lot. We then considered going to the US, stocking up on everything and then flying to the south of Argentina then cycling along the west coast back up north. This would’ve meant spending a large chunk of money getting to the US from Brazil, getting the gear and going back. We were also considering going home as we’d have some money to go home with. We thought about it for a while and made a pro’s and cons list. The pro’s of going to the US outweighed going back home and so we bought a ticket to LA not long after!! Flights were too expensive to start from the bottom of Argentina so we decided to cycle south straight from LA. We were lucky enough to stay with a friend of one of Kel’s brothers and house sit while he and his girlfriend went back to Australia for a few weeks. In that time, they gave us their house AND car! They are so generous, kind and made us feel so at home. Thank you so much you guys! We got to work immediately on organizing all of our gear needed for our bike trip from LA to Ushuaia, Argentina (the southern most city) – hopefully. It was pretty stressful and overwhelming trying to prepare for a trip this big, with a wide range of temperatures and landscapes, all while trying to keep the weight (and cost!) down as much as possible. I just felt way too overwhelmed and Kel did a really great job on researching everything for us and so far everything has worked out perfectly! I didn’t realize how Mexican some parts of LA were, which was so awesome. The amount of Mexican food trucks – cheap and delicious tacos and burritos- were the best!! It was also cool hearing lots of Spanish being spoken. It definitely made us excited for when we get to Mexico. For Thanksgiving we managed to drive up to Santa Cruz. The drive was awesome. We drove through Big Sur and stumbled upon a sign saying ‘elephant seal vista’. By this stage, I was driving as Kel was exhausted from waking up early and was also having pretty bad motion sickness. I woke him up and he wasn’t too keen on getting out. I pulled him along anyway and thank goodness I did because we saw lots of elephant seals! It was incredible! They were all basking in the sun on the sand, literally metres from the highway!! We even saw two males fighting. The sounds they make are hilarious. I’m so glad I stopped! We had many stops along the way to enjoy the view, and have a break from the windy roads. We drove up to Santa Cruz to spend the holiday with some family friends of Kel’s parents, Mike and Lis. Such lovely people!!! They have this cute little cozy, secluded house amongst big redwood trees yet the beautiful beaches were only a 5 minute drive away. What a perfect location! Thanksgiving dinner included turkey, potatoes 3 different ways, sweet potato with cranberries and melted marshmallows on top, veggies and PIE! Apple and pumpkin pie with hot apple cider. I was so curious to try pumpkin pie since it seems pumpkin everything is all the rage in the US haha. Maybe I had built it up a lot in my head but it was a bit disappointing. The apple pie on the other hand was delicious! The next day, to try our bikes out and work off the feast, we went for a bike ride. 5 mins down the road a fellow cyclist stopped us and asked about our future trip, wishing us all the best. That is one thing I love about Americans; they aren’t afraid to speak to random people and say hello. In Europe when we cycletoured, there were many times where we could feel people looking at us and wanting to find out what we were doing/where we were from/going but they were a bit shy or maybe scared to speak English (if they thought we spoke English). And if we engaged first then it would be a great conversation but here in America, everyone is so eager to speak! It’s great. We followed a bike route which took us to a bit of a main road which we were getting a bit sick of so we stopped. About to turn back, we saw a cyclist stop near us on the other side of the road, lift his bike over the fence and follow a dirt trail. We headed over that direction and saw a sign saying the area was a state park and to be wary of mountain lions!!! I was pretty scared and was on the alert. We later found out that mountain lions attack by ambushing people and they are pretty savage killers. Glad I didn’t know that!!!! The trail was actually so much fun through the woods, crossing over a ‘bridge’ made from a log and testing the bike off-road. The next morning we left early to drive further north to meet our friend Mallu! We met her in Cambodia when we volunteered teaching English. She shouted us brunch (thanks again Mallu) and we had such a great time catching up, we could’ve spent a lot more time together! Unfortunately we couldn’t stay longer as we wanted to quickly drive through San Francisco since we were so close, before driving back to LA that same night. We drove around, walked down Lombard St and then went around the wharf/pier area and got some snaps of the Golden Gate Bridge. Since we still didn’t have all of our bike gear (we were still waiting on two orders to arrive), we even checked out a few bike shops in case they stocked what we were looking for. They didn’t. We did want to try to squeeze in Yosemite but time got the better of us so we have left that for our next trip to the US! While here in LA, one of my friends from New Jersey that I grew up with before I moved to Aus when I was 8, happened to be in LA when we were there! We met and caught up on the past 17 years (!!!) over lunch which was so great. I’m so glad we got to meet up while I was here, especially as we weren’t going to the east coast. It was Kel’s birthday (26!) while we were in LA! That morning we picked up Jai and Mecki from the airport early in the morning so we were both pretty tired. We spent most of the day in bed, sleeping and doing more research! We also had to stay at home as we were waiting on our sleeping bags to be delivered. That evening we went to a local restaurant for a meal and celebratory beer. I made a healthy-ish ‘brownie/cake’ too haha. December 1st we set off from our ‘home’ in LA! After a bit of a shaky and nerve racking start, we soon got into our rhythm, making our way across LA to the coast and then south to Newport Beach. We used the warmshowers app/website to connect with Quintin who we stayed with that night. We just LOVE that app (read more here) and we had the best first night ever! Quintin made us guacamole and salsa and then a feast for dinner, sitting around the table talking all night! In the morning he cooked us breakfast burrito’s, gifted us a portable solar panel (so nice), electrolyte sachets, helped us to fix our bike computers and gave us so much helpful advice and tips!!! Cannot wait to see him again, perhaps in Aus or Hawaii!! All this hospitality from a ‘stranger’, in the beginning that is. Thanks again Q!!! Day 2 was a bit of a tough one. We were struggling against a headwind (the worst), and then we went the wrong way through a military base, got stopped by the police who were very serious – we are cyclists, cmon! Then we had to ride all the way back. The good thing was we had been struggling up hill for at least an hour, then turning around with the wind at our back, what we had covered in that time took us only 10 mins!! We had to ride along the 5-lane (each side) freeway for about 40 minutes pedalling as fast as we could to get off that freeway! There was no alternative as the freeway was in between the military base and it was not fun. Adrenaline was pumping and when we got off the exit, the sun was starting to set and we checked into a motel. Now we are organizing all of our gear and routes before we get into Mexico. We will be going down the Baja peninsula to La Paz where we will get a ferry to Mazatlan (on the mainland). That’s the plan anyway. Our plans change every day so who knows what we will do haha but we have been following other bike packing blogs and asking others for help/advice. 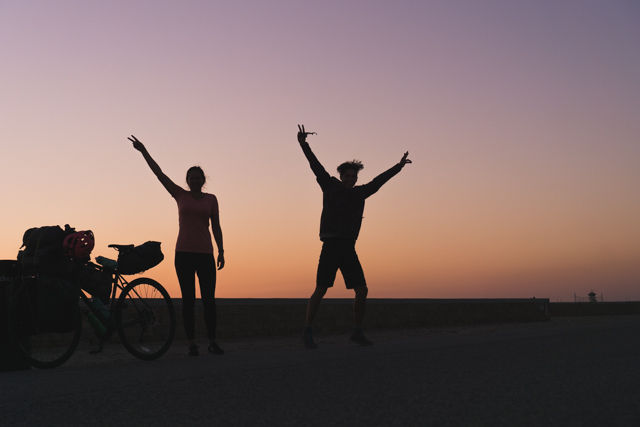 One thing that’s great about bike touring is the online community that are so friendly and helpful! There’s a few riders a bit ahead of us and behind so hoping to catch up with some along the way down south. You two are such an inspiration! Thank you for opening my eyes to a different way of exploring the world. Your stories stoke the wanderlust in me that got submerged under the weight of responsibilities and raising a family all these years. It’s time to begin dreaming of travel again. Love your new cover photo…geez such beautiful people you are. Enjoyed this post so much I dug further into your blog and oh my, your time picking onions sounds crazy! Glad to see you’re safe and I look forward to following your travels down south. Thank YOU Kelly!! For your bright, bubbly, caring and loving self!! It was seriously a pleasure to meet you. Hahaha yes our onion picking time was definitely an adventure…. can laugh back at it now!